Every season offers new and exciting activities in the Minocqua area. No matter what the season, you can always count on there being something to see and do…even if that thing to do is simply unwind in a cozy lakeside cabin. Read on to find out some of the highlights of each season in the Northwoods. There’s something special about the Minocqua area in the springtime; everything is springing to life. Come up here for an up-close-and-personal look at wildlife, or bring your bicycle for a scenic ride on our trails. Spring is a perfect time for fishing, and thousands of lakes, streams, and rivers throughout our area ensure plenty of peace and quiet. Relax along the shores of our lakes or grab a paddle and get on the water – after all, we are nature’s original waterpark. Summer is our busiest time in the Minocqua area, but even during our peak season, you can always find a peaceful place to unwind. After you’ve relaxed, it’s time to hit the water! Home to one of the world’s largest concentrations of freshwater bodies, there’s no shortage of lakes, streams, and ponds to choose from. Take your pick of your water activities: kayaking, canoeing, stand up paddle boarding, jet skiing, swimming, and fishing…to name a few. Great attractions like zip lining and the zoo will round out your stay. Fall comes out in full glory in the Minocqua area, with hues of gold, red and green throughout the majestic forests. The explosion of color makes fall the perfect time to explore our rustic roads and hike your way through hundreds of miles of trails. Stop by any of our numerous supper clubs for an authentic Friday Fish Fry and a Brandy Old-Fashioned. 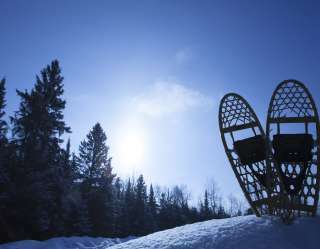 Winter is a peaceful time in the Northwoods, with the average snowfall around 65 inches. Don’t confuse the silence of the snow with a lack of activities though – there’s plenty to do before spring comes around again. Head for the hills and enjoy some tubing and sledding or grab your furry friend and learn how to skijor. Cross-country ski and snowshoe trails offer miles of endless enjoyment and snowmobilers will find plenty to explore as well.